Howard, S. (2018). Reflecting on my first solo advising session as a learning advisor trainee. 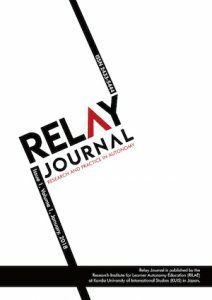 Relay Journal, 1(1), 78-88. This reflective advising session occurred near the end of the first course of a comprehensive four-course training program that aimed to teach the participants how to be Learning Advisors. The advising session was conducted at the self-access learning center (‘The SALC) at Kanda University of International Studies (KUIS) in Japan. Participants in the week long, hands-on training course had taken a variety of workshops and had done a variety of activities, principally a series of scaffolded, highly controlled ‘advising’ sessions that progressively took them from trainer-led group advising to finally holding their own unsupervised, one-on-one advising session with a single student. I am an American who has been teaching English for three years in an English preparatory school (The School of Foreign Languages) at a government run university, Ankara Yildirim Beyazit University (AYBU), located in Ankara, Turkey. I am the Co-Coodinator of the Independent Learning Center (ILC) and I have conducted a few advising sessions in the ILC at my university prior to beginning my advisor training at KUIS. I am not fluent in Turkish and I can only conduct sessions in English. This means I see far fewer advising students than the ILC Coordinator, a Turkish national and PhD candidate, who is equally fluent in both Turkish and English. The students that I see tend to be either higher level English students (intermediate or above) or they can be any level but they naturally have more confident personalities (i.e. they aren’t afraid of talking in English with a ‘native English speaker’.) I plan on earning a Masters in Teaching English to Speakers of Other Languages in the future. The advisee in this session is Yumi (pseudonym) who at the time of the advising session was a student studying English at KUIS. Yumi plans on becoming an English teacher to children in Japan. She is also a student volunteer at the SALC. She had volunteered to have an advising session with one of the visiting advisor-trainees from Turkey. As a student staff member at the SALC, she had seen the visiting advisor-trainees during their first day at SALC and had then specifically sought to arrange an opportunity to talk with ‘the American girl.’ Her manager had then informed her about the opportunity to join some of the advising training sessions, to which Yumi immediately took advantage of. This advising session took place on the ground floor of the SALC center at KUIS. The Advisee was asked to choose a location within the SALC center that she either preferred or felt comfortable at. Yumi was hesitant to choose a specific spot, but she eventually chose a tiny cubicle that was enclosed by shoulder-height brick wall. The cubicle was only large enough to accommodate a single table and two chairs. While the enclosed nature of the cubicle allowed for a more intimate setting, it was located on the other side of a floating wall (a wall that does not extend all the way up to the ceiling, thus does little to fully block out noise transfer) near a section of the SALC that was specifically set aside for talking in multiple languages. This noisy environment often meant that both the advisor and advisee had to strain to hear each other. On the positive side, however, I loved how ‘safe’ the room felt due to its small size. We did not have to worry about someone walking in and accidentally interrupting our session. The purpose of the session was to allow me, the Learning Advisor trainee, a chance to put together everything that I had learned about what advising is –and isn’t– during the week-long training course by holding a ‘final’ advising session – the first and only unsupervised one-on-one session each trainee had at KUIS with a Japanese student. At the time, I was caught somewhere between feeling really excited and absolutely terrified. By the second day of Module 1, I learned that I had probably never really listened before to a student who was seeking advising help. I actively avoided asking students about their personal details, such as getting them to tell me about their background, or asking them questions so I could learn about their life story and their feelings about language learning. This was because I was too focused on (1) trying to avoid making them uncomfortable by getting too ‘touchy-feely’ (i.e. asking about personal details) and (2) trying to solve whatever problem they had –problems that I now realize I had largely invented so I could feel good about myself and my ability to ‘fix’ the issue because advisors always ‘fixed’ the issue if they were any good. I was excited because this was my chance to see if I had overcome any of my self-identified faults as an advisor. On the other hand, I was extremely worried I would ‘mess up’ and ‘fail’ somehow during my advising session. My trainer waived around a list of all our names and the names of our student advisee. I stepped outside the relative safety of the training room and into the crowd of gathered Japanese students. I called out my student’s name, something I had to do three times. I never imagined how difficult it would be to pronounce unfamiliar Japanese names when trying not to let a room full of students see how nervous I was feeling. Satoko had been teaching us about the power of metaphors in advising all week and ‘shaking like a leaf’ kept coming to my mind. Once the advising session actually started, I felt much less nervous. My biggest concern had been that my mind would blank out and I would forget the order of all the different advising steps or the many different techniques such as restating, summarizing, or mirroring, that we had been taught. I was especially concerned about asking my student about her personal background, her personal life, and about her personal feelings about things that could potentially be quite private or revealing. At the same time, I also wanted to keep as much of an open mind as possible and just see what happened. In order to facilitate both of these objectives, I had brought along a worksheet to an activity we had done early in the week, the Relay Race (team advising), because I liked how it listed the steps and order of a typical advising session, particularly since it even had example advising questions next to many of the key stages. I saw it as my safety net, and as a way to keep me on track if I got lost. Artificial courage, if you will. I referred to it a few times in the beginning of the session –I was so nervous I remember I forgot how to ‘start’ the session, but as time wore on, I looked at it less and less and I stopped looking at it entirely by the middle of the session. All during the session, I kept thinking to myself: Wow, this is actually working! I’m holding my first ‘real’ advising session with a student that I don’t already know and nobody is dying. I clearly remembering feeling quite lucky to have gotten Yumi because we developed such a close rapport so early on in our session. We ended the session by sharing our skype information and trying to make arrangements to talk more in the future. I felt like I had been talking with a new friend, not an advisee. I also remember how much easier all the various steps of advising worked better when it was only one of us advising a student, unlike the different team advising sessions we’d had during the training. To be honest, I wasn’t really sure what the purpose of the final advising session was. I thought it was to see if we could put all the pieces together and either sink or swim. I had concentrated on a few points largely to ensure that I forced myself to give up old, negative habits and to make the session 100% focused on the student: (1) letting the student talk and listening to the student, (2) asking about personal details like their background, life story, and feelings, and (3) don’t problem solve or invent problems. I wish I could say that I knew what I was doing or that I was using Advising Skill X to bring out Behavior Y in the student on purpose, but again, I was trying to ensure I kept an open mind to what the advising process was according to how it had been presented in the workshop. As for the student, I wanted to see if I really was able to learn so much more about her by asking about her feelings, etc. I was skeptical. Specifically, I still believed it was rude to just ask someone “Heyyyyy, tell me about your personal life, your background….and how do you feel about that, hmmm?? ?” I was worried the student would get mad or would refuse to talk because I was getting too personal. To help overcome this, I took the Relay Race sheet with me as I saw it as a sort of How-To-Advise roadmap. It kept me from getting lost, forced me to be open minded, and it allowed me to help the student better by asking the right questions at the right time. As it turned out, the student didn’t get mad at all and she ended up revealing eye-opening details when talking about her life story and her feelings about it! I still don’t think I’ve grasped the full implications of that yet. Part of me wonders if it was just her, if she was ok with it, but the next student might think I’m too nosy. This was accomplished largely through Repeating, Restating, Empathizing, Complimenting and Summarizing. I tried to talk less, and when I asked her a question, I tried to give her time to answer it…even if it meant there was an awkward pause for a bit. I focused on listening to listen –not listening to have something clever to say in response. I listened, but I still talked excessively. I asked her many small questions to help her keep talking. For example, when she said she wanted to be a teacher, I restated this, but in a question form. “Why do you want to be a teacher?” In this way, she began to reveal more and more about her background, life story, and feelings and the best part was that she initially introduced each item and I merely restated it as a genuine question. I was surprised at how much I learned about her and how she only seemed to grow closer to me in feelings –quite the opposite from what I had expected with the touchy-feely questions. It was also surprisingly easy —and extremely interesting—to just take what she was already saying and keep it going by restating, summarizing, or restating the info as a question. However, I worry I overdid it with restating and summarizing and maybe I ended up talking more than I should have. Instead of restating, summarizing, empathizing so much, maybe I can build rapport in the future by asking more questions and thus speaking much less. Nonetheless, I feel I didn’t invent any problems for her, but it’s all too clear that I still tried to fix the one issue that she did mention. Stephanie: So, that actually brings up a good question. When you have children in the future, when will you start teaching them English? For example, will you start when they are three years old? Yumi: But actually, my cousin –I have cousin– my cousin…ah…can speak English better than me actually. Stephanie: Really? You’re pretty good! Stephanie: Well, why do you think his English is better than yours? Yumi: Because, um, they are speaking so fluently and I also surprised, they are, their words… They use big words…. Stephanie: So you think he has a really good vocabulary? Stephanie: So you feel like he’s more fluent than you are? Stephanie: So, ah…. I’m curious, what do YOU think being ‘fluent’ means? To you? What does being fluent in English mean to YOU? What does that mean? Yumi: …So children, when they start to learn English, they…. Yumi: …They can say words…they can speak so clearly. These days, I often….. [short pause] I often talk people in English, like for example, from America… And these people could understand what I say but…. What was I say? Stephanie: That they could understand you? Or that they could not understand you? Stephanie: Did that bother you? Did that bother you that they couldn’t sometimes understand you? Stephanie: What do you mean they couldn’t understand your grammar? Yumi: Ahhhhh……. Well….. I want say—I wanted to say—lot of thing, but I couldn’t say, like I couldn’t use words, like vocabulary… So I want say this, but actually, I can say this. Stephanie: Is that because of ….ah…. vocabulary? Or grammar? Stephanie: Well, see, the wonderful thing about kids is that they are fearless. They’re not worried. Stephanie: As adults, we’ve learned to become afraid. Little children aren’t afraid. They can go up to anybody and blah blah blah. They don’t worry about their vocabulary. They just enjoy experiencing speaking English. It’s also clear that I may have been problem solving or at least ‘heavily guiding’ the student towards an activity I felt could solve her problem. Stephanie: –a theater musical, and you watch this and then you all talk about it? Stephanie: …it’s going to have a certain type of vocabulary. And when you talk about that video, you practice that vocabulary. Stephanie: And each video has a different vocabulary and you practice this vocabulary talking about it… So after you do a bunch of videos, you’ve actually got… lots of new vocabulary. Stephanie: It would be fun, right? My feelings are mixed when I reflect back on my session. I feel I accomplished some of my goals, I spent the first two minutes just learning about the student’s background and life story and asking her feelings about certain parts of it. On the other hand, I feel I’ve stagnated on other goals and I might have noticed a pattern associated with that. First of all, I realize I should focus on asking the student more questions in the future and I should back off on unconsciously trying to fill ‘dead space’ with words or start speaking if I suspect the student is feeling uncomfortable because they can’t find the words they want to say. Secondly, though I was trying to empathize with the student and restate/summarize to show I was listening and paying attention, it’s clear to me as I listen to the conversation again, that I took it too far and ended up ‘speaking for the student.’ I’m sure I was still trying to help her by solving her problem and I simply rationalized it at the time by saying ‘it’s just restating/summarizing so it’s *legal*.’ At least I got past my fear of asking about personal details, backgrounds and life stories. I’m still shocked she didn’t get mad, or that I learned so much by asking her how she felt about some things that she revealed. This was one the first homework assignments that came during the second course of the Learning Advisor Training. I’ll be honest, at the time, I saw no value in this exercise because I thought I had already reflected on it once and thus believed there was nothing further to gain from reflecting again about my experience with a colleague. However, this reflection profoundly changed my view of myself as an advisor trainee and why I find myself struggling with the concept of advising. Stephanie: …I was HEAVILY guiding her towards seeking the solutions that I have already foreseen. Stephanie: [Laughs] Well, actually, [colleagues] and I talked about this during the second exam invigilation today. And the conclusion we came to –what’s happening—is that this is exactly what was talked about in that one science article that she gave all of us in Japan, which is actually in the optional reading folder for week one in the Edmodo course folder section. Stephanie: …and tell the students what to do. Stephanie: So we’re still—basically, even though we’re learning to be advisors and we were more open minded, we were still essentially wearing our teacher hats..
Stephanie: …during our advising. None of us has essentially found our advising hat yet. BUT, we can see the path. [pause] …It’s… incredibly hopeful that we have all realized that none of us were wearing an advising hat. And the simple fact that we can recognize that we were all ‘teaching’ during our advising sessions—That’s good. If we were in the denial stage, this would be impossible. We’d be wasting our time. Stephanie: But the fact that we understand what happened, what is happening, then we can slowly work to resolve it. And honestly, because of our experience, the reality of the situation, it’s going to take us time to learn how to take our teaching off and replace it with an advising hat. And further reflection led me to understanding how I needed to take myself from teaching to advising. Gamze: How do you think you can manage this by—for your own self? To get rid of the teaching hat? Stephanie: –but instead I was inventing problems that I could easily solve so that I felt better and the student felt good. Even if both of us were still confused, we felt good like we had accomplished something. Stephanie: –I mean the mindset of I’m not here to advise, I’m just here to talk to the student in whatever area they want to talk about. I think if I can keep that front and center in my mind, then I will have a better chance of not putting on my teaching hat, thinking that I’m advising. Even more profoundly, for the first time, I realized why my trainers had been so adamant that only the student can ultimately solve their own problems. For the first time I understood what my real role was as an advisor. Stephanie: …and If I even think I know what I’m doing, then I’m preventing the magic from happening. That’s what I’ve done in the past and that’s what I need to stop doing now. The problem is that as a teacher, that goes against everything that we’ve ever been taught. Stephanie: You know, God knows, if you walk into a class room being not prepared, then you’re going to be attacked. Stephanie: Literally! That’s what’s going to happen, you’re going to be attacked. We all know that. So—but as an advisor, I think that in order for the magic to happen, you can’t be prepared. You can’t be truly prepared, because if you’re truly prepared, that means you’re going to shoehorn what’s going to happen into where you want it to go, which is not helping the student at all. Stephanie: So the next time I have an advising session, I’m just basically walk in there and try to view the student as my teacher and I’m just going to basically work on just letting the magic happen. Stephanie: …but beyond that, I’m just going to go in there and try to listen to the student and try to figure out what the magic is in that particular advising session. Going forward, I will make myself a brief cheat sheet for future advising sessions, but it won’t be like the cheat sheet that I carried into my first advising session. No, my new cheat sheet will serve to remind me of the path that my reflection(s) have shown me that I need to take: (1) Let the magic happen—no preconceived notions, (2) the student is the teacher, (3) I am a sponge and my job is to absorb, and (4) figure out what the magic is for each particular session. In this way, I hope to eventually move from teaching to advising—and truly learning. This work was supported by the Scientific Research Fund (BAP) at Ankara Yıldırım Beyazıt University, Turkey, as part of Project 3934 in the 2017-2018 academic year. Stephanie Lea Howard is the assistant coordinator of the Independent Learning Center (ILC), an EL instructor and learning advisor at AYBU-SFL. Her interests include advising in language learning, shadow-reading, and designing EL games. It was very interesting for me to read your reflections on a significant moment in your development as an advisor. You recorded your thinking in a very natural and personal style, which made it easy to understand what you were feeling. Your writing helped me reflect as well on my own experiences as a developing learning advisor. I like that you were able to keep an open mind about the session and let go of your preconceptions, even though you may still had some doubts going in. It seems like you allowed yourself to be immersed in the process, and as a result, you put aside your “safety net” and got into the flow of the session. This kind of leap of faith requires trust in yourself, in your student partner, and in the reflective dialogue process. It can be scary, as you noted, especially for teachers that are accustomed to fulfilling certain roles, to step out without that safety net, so I’m happy that you were able to achieve such a positive result, and that in the moment, you were even able to step back a bit and realize that you were succeeding. I’m also glad that you found value in reflecting with your colleague, even though you initially did not anticipate that you would gain anything from it. It’s clear that together, you were able to reach some powerful insights. In my own case, here at KUIS, it was tremendously beneficial to have periodic reflective meetings with my peer mentor and other more experienced advisors, and these reflections absolutely had a positive effect on my growth. While you and your colleague were both still in similar stages of your Learning Trajectory, I can see how your dialogue with Gamze elicited deeper thoughts. In your transcript, can you see some of the things that your colleague did to help you reflect? I wonder if this was a conscious effort on her part. I have just finished my first year as a learning advisor at KUIS, and naturally, in your paper, I saw parallels and contrasts with what I experienced during this past year. Two aspects of your reflection stood out in particular. First, I have also worked on my listening skills and allowing students to talk. You mentioned the “awkward pauses” that can arise. It was difficult to deal with silence in advising sessions during my first semester. Like you, even when I thought I was consciously trying to give students space to talk, I found that I was still talking a lot and, specifically, not waiting long to fill pauses. However, I gradually became slightly more comfortable with listening and silence, and I realized that providing students with that extra time also gave me opportunities to pick up on more subtle cues from them. Second, I also identified with your discussion of being directive or trying to solve problems in advising. I see that focusing on listening, in turn, helped you to back away from making assumptions about students’ problems. In shifting from classroom teaching, like you, I was very conscious of this aspect of my advising. In the spirit of letting students find their own solutions, I ended up becoming almost reluctant to step in. I later realized that there was room for me to offer feedback based on my experience and that part of listening carefully was finding the moments to insert my professional opinion. Thus, I can understand why you hesitated to step in too much. In the excerpt that you provided, it seems that you did this successfully. I like how you used smaller, closed-ended questions to build up to more reflective questions. Then you were also able to give your advisee your personal input. You expressed a belief that you were guiding her too directly in suggesting a strategy. I didn’t really see it that way—you gave the advisee something she could take away from the session and try. Whether that comes across as directive may be related to how you suggest such strategies. These issues remind me of ones raised by other advisors on the same trajectory, as in Lammons (2012) and Morrison and Navarro (2012). There, the topics of silence, directiveness, and how to make suggestions were all raised as well. Others’ experiences can give us new insights and remind us that although everyone’s transition to advising is unique to themselves, there are common issues that many of us have. I can see that one of your biggest accomplishments was that you successfully developed a positive personal relationship with the student. That’s a really important step! I am curious, however, about the fact that you don’t seem totally convinced that this will be effective for you in the future. In referring to this skill, you use the term “touchy-feely,” which has some negative undertones. Reading this, I wondered what “touchy-feely” means to you, as you used questioning and built rapport appropriately to help your student open up. You also expressed concern that other students might find your questioning nosy. Students often come to advisors for a genuine reason (some question or problem), and in those situations, do you think they would be totally unprepared to share about themselves? Yes, your concerns about coming out and peppering students with very direct questions are totally appropriate. That’s where strategically questioning as well choosing the timing for your strategies is important, and I hope that with experience, this will become more natural for you. Finally, I wonder if your doubt might be related to this session not being in your usual teaching context, as it was a slightly artificial situation with a student from a different culture than the ones you normally see. How have your concerns changed since returning to Turkey? Were the skills you learned in Japan immediately transferable to your Turkish context, or did you make any adjustments for that context? In the reflection with your colleague, you talked about spotting your “path” to being an advisor. I wonder what your path looks like now and how it might be different from my own. Thank you for sharing such personal thoughts, and I hope we can continue communicating about our development. Lammons, E. (2012). Pathfinder: Silence is at the heart. Independence: The IATEFL Learner Autonomy SIG Newsletter, 54, 29-32. Morrison, B. R., & Navarro, D. (2012). Shifting roles: From language teachers to learning advisors. System, 40(3), 349-359. Thank you so much for you wonderfully insightful and reflective review. I immensely enjoyed meeting you at the KUIS SALC. Your personality -insightful, optimistic, curious, energetic and yet calm and centered, contemplative, and genuinely interested in helping others- really struck me as being such a perfect match for an adviser. I was so happy and inspired when Jo told me you had reviewed my paper. I looked up to you, same as I did to everyone there, but as someone much newer to advising than say Jo, you served as a more direct (and more obtainable) role model. I’ve become much more comfortable in my advising at this point. I’ve learned to view every student as my ‘teacher’ as this keeps me in a more passive role and it allows me to make a more genuine connection with a student simply because I find myself naturally ‘taking a step back’ rather than dominating the session. It also gives my curiosity free rein and I find I’m quite happy to listen to the student with open interest -and interest they can sense. By default, thankfully, this means I no longer find the personal background/life history questions as ‘touchy feely’ i.e. I’m no longer worried I will offend them by asking about their personal life. Advising has changed my life and my perspective on so many things. It’s hard taking a step a back and learning to not worry, but magic cannot exist in preconceived notions. This is what I have to remember.